When I read about Yelp Drinks 2013 I have to admit I got excited. I am something of a craft cocktail obsessive and the chance to check out a few places I’d been hearing about for half price was too tempting to miss. The deal is simple, 20 local bars and restaurants agree to feature three of their drinks at half price anytime before nine during the featured week, which just so happens to be this week. The timing was great for me because I’ve just started doing a second, all alcohol, podcast called Bottoms Up and I thought that featuring some exciting local bars would make for a good show. So last night Charlie, my partner-in-crime and co-host, picked me up and we hit 5 of the bars in 90 minutes. You can listen as we talk to the bartenders and try the drinks starting Friday over on the Charlie Tonic site but here is my rapid fire review of the five locations we hit. 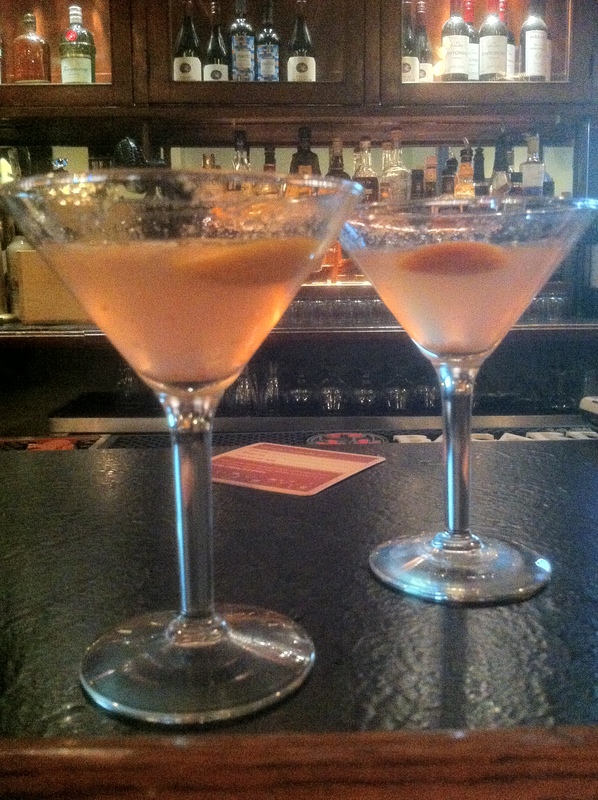 Blood Orange Martini at Mayberry. Mayberry: I’ve been wanting to try the gastro pub for awhile now so we started here with the plan to get some food while we had a drink. Oddly enough the menu really didn’t appeal to me. Everything seemed to have pork belly and I know that doesn’t sound like a problem but it just wasn’t what we were in the mood for so we settled on ordering two Blood Orange Martini’s and some Bacon Garlic Popcorn to snack on. The Blood Orange Martini was made with vodka, freshly squeeze blood orange juice, and triple sec. It was an uncomplicated and refreshing drink and the driest of all the cocktails we sampled. Not too sweet at all and if you don’t like the taste of vodka you probably won’t like it. The burnt orange peel was a nice touch. Japp’s Since 1879: Of course I am no stranger to Japp’s but with it right across the street from Mayberry I couldn’t walk past without trying a drink. 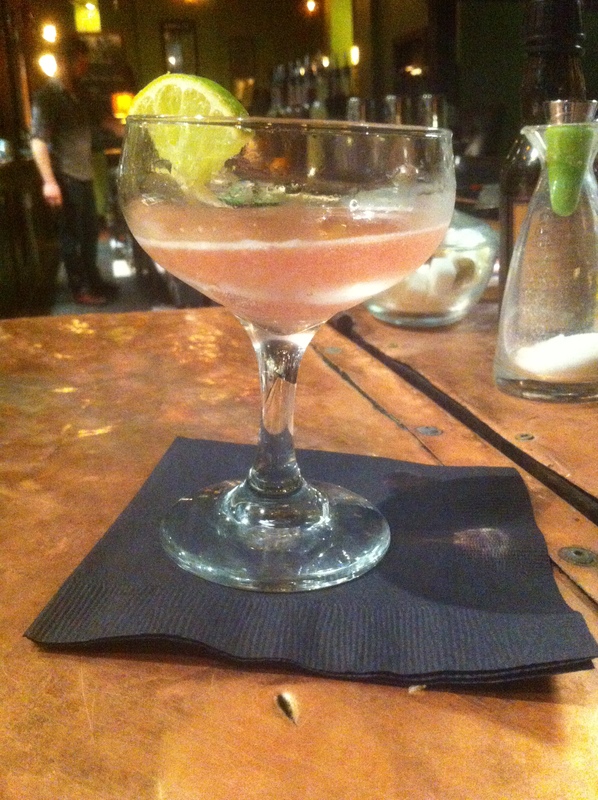 Since we were in Over the Rhine I decided to order the OTR Cocktail and it was an interesting experience in having the same cocktail made by a different person. 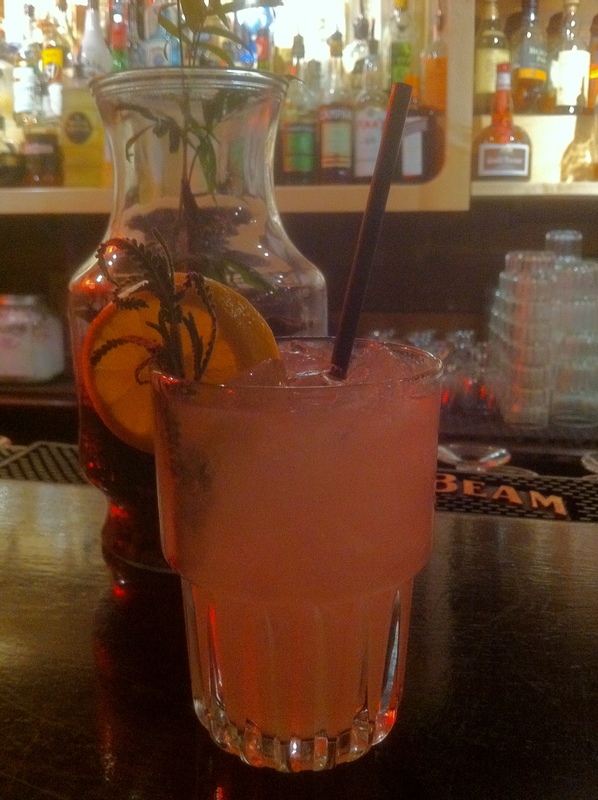 The OTR has vodka, vanilla, fresh squeezed lime, cranberry and rose water. The first time I had it the vanilla and rose water came through and it was a much softer and sweeter take on the old stand by combo of vodka, cranberry, and citrus. This time the lime was much stronger and I didn’t taste any vanilla at all. Sadly, this was the first time Japp’s has let me down. Taste of Belgium: I’ve been a fan of these addictive little waffles since I first picked them up at a farmer’s market but I haven’t been to their new restaurant yet, in part because I thought that as much as I love the waffles, eating them for dinner seemed a bit much. But it turns out that Taste of Belgium was my favorite food stop of the night. To make up for the disappointing and over-priced popcorn, Charlie and I decided to split a burger. It was delicious and the toppings of bacon, goat cheese and caramelized apples complimented each other beautifully. Not only was the food great but the cocktail here tied for first place of the night. 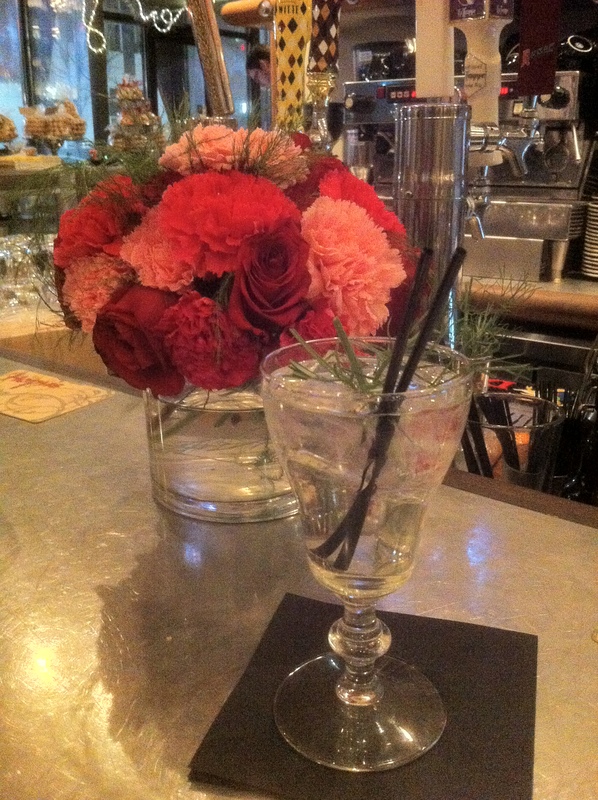 The Rosemary Bistro was made with Watershed Bourbon Barrel Gin, house-made rosemary leek syrup, and topped off with tonic water and a sprig of rosemary. The result is a crisp and slightly savory take on a traditional gin and tonic. Two thumbs up for this one. 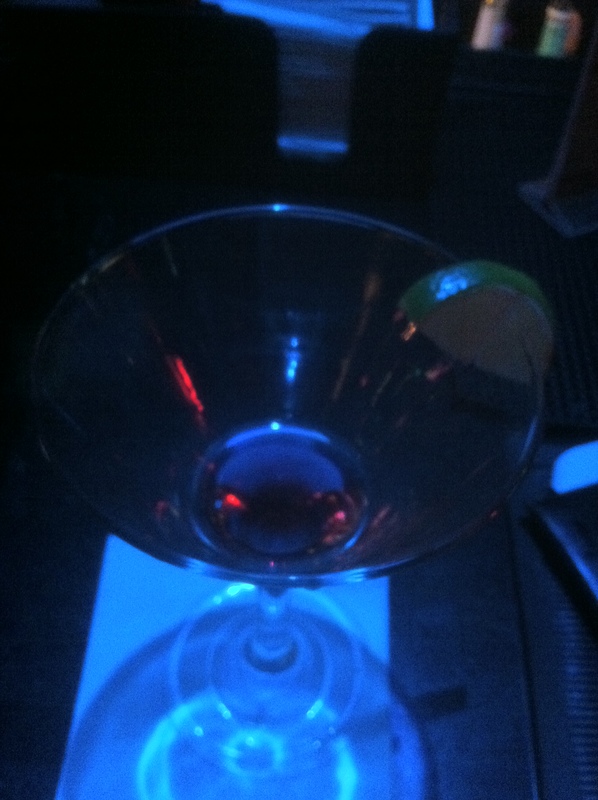 What’s left of my Yelptini at Below Zero. Below Zero Lounge: The drink here was the most disappointing but the atmosphere was the most fun so I guess it’s a draw. I ordered the Yelptini which has vodka, triple sec, and cranberry juice. Now you may be saying to yourself, as I was, wait a minute isn’t that basically a Cosmopolitan minus the lime? Yes indeed it is and it tasted basically like a Cosmopolitan as well. Nevertheless, a cosmo is a nice cocktail and I managed to forget to take a picture until the glass was nearly empty so it’s not like I didn’t enjoy it. The crowd at Below Zero were unpretentious, talkative, and just plain fun to be around. I admit I was disappointed when it was time to move on to our final stop. Neon’s Unplugged: I never though I would enjoy a bar called Neon’s but this is where we got the second winning drink of the night. With its long narrow interior, dark wood beams, patrons wearing knit hats, and a dog laying by the entrance Neon’s felt like a pub in a European fishing village but the variety of craft beer and house-made bitters was decidedly modern. We decided on the Smoked Elderflower cocktail and this one was a winner. Something like a smoked gimlet, this drink was made with vodka, smoked fig bitters, St Germain, a splash of lemon juice, Sprite and then garnished with fresh lavender and a lemon wheel. The result was a smokey-citrus taste that was really unique and enjoyable. This is a bar I will definitely be trying again. If you want to try these or any of the other 55 drinks that are on special during Yelp Drinks you have until Sunday to make it out. If I get the chance I will be stopping by Arnold’s for their Maple and Bacon infused Wild Turkey Old Fashioned. Also in the interest of full disclosure and because I don’t want everyone thinking that I regularly slam back five cocktails on a work night, except for the first stop Charlie and I shared one of each of these drinks so it’s not as bad as it looks. Drink happy and drink safe! You can hear Charlie and I try all of these drinks on Episode 2 of Bottoms Up.